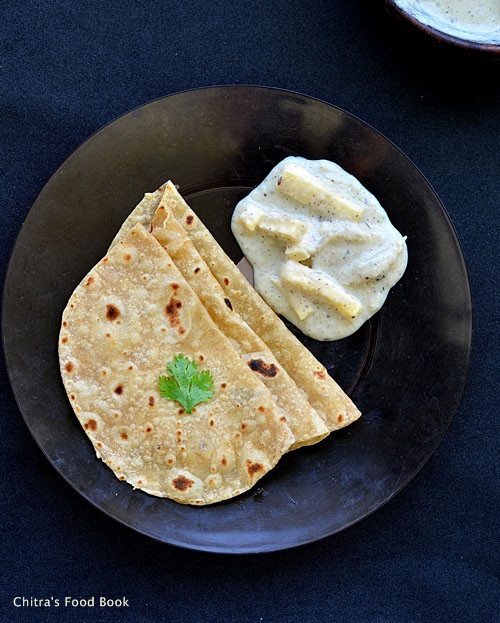 Today I made this Paneer white kurma after seeing the recipe in a cookbook by Deepa sekar. She had given the title as”Paneer Pasanda” but I guess paneer pasanda recipe is different. 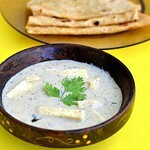 This white gravy is very much related with Shahi paneer masala. So I named it as “Paneer white korma” after seeing its color. 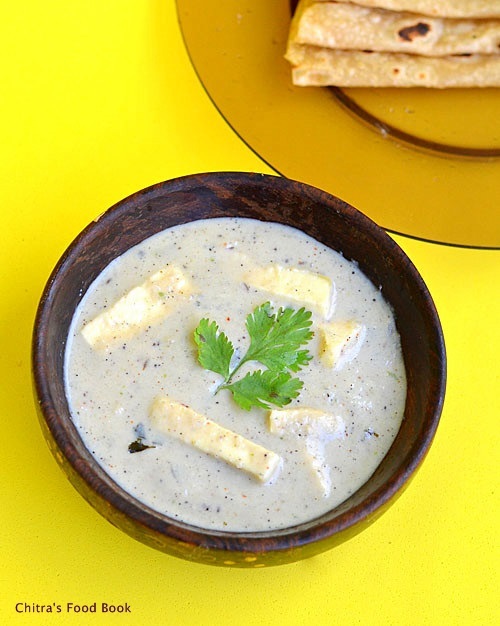 This gravy is of pucca North Indian style and not related to South Indian kurma in any way. There is neither tomato nor coconut used in this recipe. Boiled, cooked onions with milk makes the base for this white based gravy.So this korma has got a mild sweet taste which I loved it the most. Basically I like the combination of sweet and spice taste in gravies.So I loved this gravy to the core and I licked the kadai thoroughly before washing. This white kurma(vellai kurma) tastes the best with chapathi/Roti & Naan but not with rice.I packed it for Sendhil’s lunch box today and waiting for his feedback. Friends,if you like mildly sweetish gravies,do try this recipe.I am sure kids would enjoy this with chapathi. Chop the paneer into cubes or thin strips as i did.Keep it in hot water till use.This helps to keep the paneer stay soft until use.Slice onions and cook them in 1 cup of water. Drain the excess water and grind onions along with cinnamon,cloves,cardamom,green chillies,ginger,garlic,cashews using 1/2 cup of milk.Set aside. Heat oil + ghee in a kadai and splutter cumin seeds. Add the ground onion paste and cook in very low flame.Add salt and saute till raw smell goes off.Add 1 tsp of sugar.Mix well. Mix 1tsp of corn flour to the remaining 1.5 cups of milk and add it to the gravy.Boil well for few minutes till the gravy thickens a bit.Lastly add the paneer strips,crushed kasoori methi and garam masala powder.Mix well.Give a quick boil and switch off the flame. This gravy thickens as time proceeds.So adjust its consistency by adding milk and check for salt.Enjoy with chapathi ! For variations u can add 1 tsp of red chilli powder and 1/2 tsp of dhania powder instead of green chillies. But the color of gravy turns orange’ish like paneer butter masala. Adjust the quantity of milk based on need.Kasoori methi gives a restaurant touch.So never skip it. 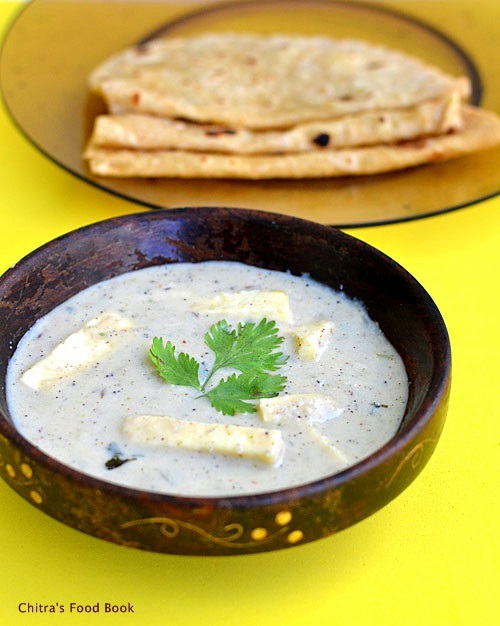 Enjoy this yummy paneer gravy with chapathi or naan.Tastes rich and creamy ! Rich looking paneer korma..looks too good.